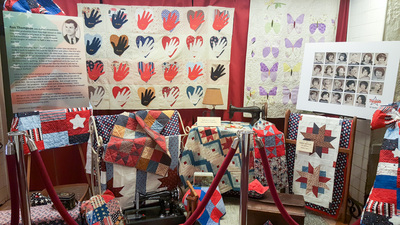 The THS ‘67 Quilters is the brainchild of Jane Thompson Webb, who wanted to honor her brother and all Veterans in the Troy High School Class of 1967. Jane was new to quilting, but had a drive to do something to memorialize her brother who died as a result of chemical poisoning from the Vietnam War. In August of 2015, while sitting in the corner booth at K’s Hamburger Shop, she recruited a few high school friends with willing hearts and hands to bring her dream to life. Beginning that October, the group met weekly at Jane’s home to quilt. She started each new quilter off with a “boot camp” quilt kit. Word spread, and more and more classmates showed up at “the cabin” to help in any way needed. As the pile of quilts grew, so did the camaraderie with friends, many of whom had not seen each other since high school. Out-of-towners also dropped in at the cabin while visiting Troy. They remained in touch , supporting the cause. While friendships were rekindled, the common denominator was always the Vets and expressing respect and gratitude for the sacrifices made, especially during the Vietnam era when being in the military was not popular. On September 9, 2017, the THS ‘67 Quilters will present 50 quilts to their Veteran Classmates for their 50th High School Reunion. 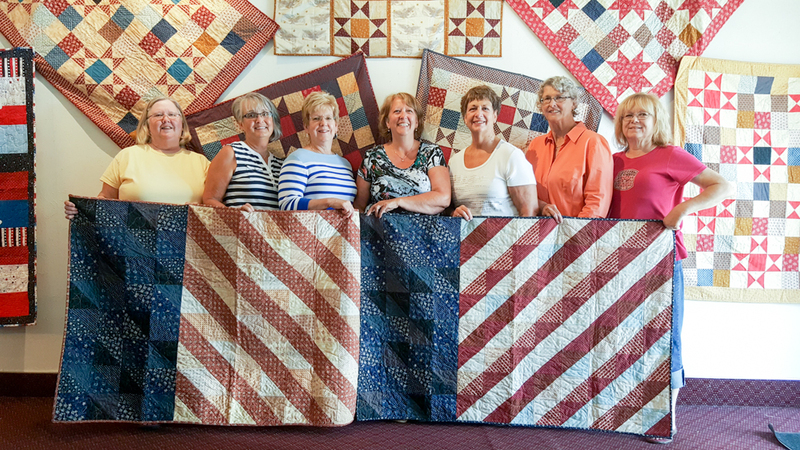 Another 50 tops, to be quilted for local Veterans this year, along with their first “Challenge” project are on display in the Mayflower Arts Center’s Lobby Gallery, September 1-30. When Paula O'Brien and family arrived home in July 2015 with their new son, Adhu, they had no plans to adopt again. The "faith-shaking process" (as described by Paula) to adopt Adhu from India took 5 long years, and all of the family's resources. Enter "Mickey", a 3-year-old orphan in China. When Paula and Scott first saw Mickey, they fell in love, and knew God meant for him to be theirs, and so they began the process all over again. This time to become a family of five. The O'Brien's are our next feature family in Art for Adoption, which will feature a series of auctions and a gallery exhibit to help raise money to bring little Mickey home. The O'Brien's hope to travel this November to go get their sweet boy! Now would be a great time to spread the word, invite your friends to be part of Art for Adoption. We can all make a difference in Mickey's life, this is Kingdom work, friends....fruit that lasts! Please take time to share and invite people in, and thank you from the bottom of our hearts for joining us in this special work. To God be the Glory! Art for Adoption began with a desire to do something to help the 153 million orphans worldwide. "Chosen," the 2nd Annual Art for Adoption Exhibit will feature a variety of mixed media artwork by local artist, Robyn Terry. 100% of the proceeds from this show will directly go to AFA's featured family, Scott and Paula O'Brien, who are in the process of adopting Mickey, from China. Thank you in advance for supporting our project and helping to bring Mickey home to his new family! Visit www.facebook.com/groups/897865620333445/ for more information on Art for Adoption. Robyn Terry is a self-taught mixed media artist living in New Carlisle, Ohio. She discovered her passion for painting in 2012 when she had an idea for a gift she wanted to make a friend. She stumbled across the term “mixed media” and a whole new world opened up to her! She sells her artwork locally and online, and hosts “take heART” parties where she speaks encouragement and leads women in the creation of their own artwork. Robyn is also a devotional writer and a self-published author at www.robynterry.com. Her devotionals were published for several years in a local newspaper, The Springfield Paper. She writes and paints under the name, Faith Miner’s Daughter, with the mission to inspire women of faith to take heART and move mountains. ​Join us November 16 - December 17, for a unique selection of collective works by the Country Workshop Artists, featuring the 2D and 3D artwork of Kyleen Greene, Jan Lendino, Sandra Kraack, Pam Ridenour, Christina Gluck, Mary Kadel, Jana Glass, Sandy Haack, Roe Kienle, and Bonnie Rashilla. An opening reception will be held November 16 from 6:30-8:30pm to honor the artists of the exhibit. Light refreshments will be served. The Country Workshop Artists group was founded in 1961 when eleven women artists began meeting and working in an old streetcar on one of the member's property. Over the last 55 years, membership has grown to 33 active artists, each creating their own work across multiple media, including watercolor, oils, mixed-media, pottery, silversmithing, weaving, graphics, and others. The women were talented potters, painters, sculptors, weavers, jewelers, etc. The goal of the CWA is to encourage the appreciation and creation of art among their members and within the community. Yearly, the CWA provides a scholarship to a graduating high school student in order to further his/her art education. An invitational art sale is held biennially in October to raise funds for the scholarship. In addition to the CWA members, approximately 50 invited artists and fine craftspeople from across Ohio offer their works to nearly 6,000 patrons. As part of the second annual Tribute to the Troops Variety Show on Saturday, November 12, 2016 from 6-8pm, the Miami Valley Veterans Museum has included many items of war memorabilia to be on display in the Mayflower Arts Center’s Lobby Gallery. The items span WWII through present day and represent our local and fallen heroes as well as events and promotions documented during the conflicts. The Second Annual Tribute to the Troops Variety Show—held Saturday, November 12 from 6-8pm— is a collaboration between The Miami Valley Veterans Museum, Hospice of Miami Valley, and the Mayflower Arts Center, as an annual fundraiser for the Veterans Museum. Designed to bring to mind the entertainment presented by the USO to troops overseas since 1941, the evening promises to be filled with great memories, singing, and dancing, as a way to say thank you to our veterans, active military, their families, and our community. The public is invited to browse the exhibit November 9-12, during regular the Mayflower Arts Center’s normal gallery hours, Wednesday-Thursday, 10am-2pm and Friday-Saturday, 10am-6pm. The memorabilia will then be returned to the Miami Valley Veterans Museum as part of their permanent display. The Miami Valley Veterans Museum—located at 107 West Main Street, downtown Troy—exists to honor, preserve and perpetuate the memory and dignity of the men and women who have served in the U. S. Armed Forces, Coast Guard, and Wartime Merchant Marines. The Museum strives to serve as an educational tool that teaches youth about our military involvement throughout the world, as well as to to provide a unique tourist destination in Miami County. The Miami Valley Veterans Museum supports the community through museum activities, educational programs, oral histories, and community programs that keep alive the contributions and experiences of those who served. All monies raised go directly to supporting the MVVM's programs and operations. The mission of the museum began in the summer of 2009 with the goal of making sure that our veterans "Shall Not Be Forgotten". Museum hours are Wednesday and Saturday, 9am-1pm. 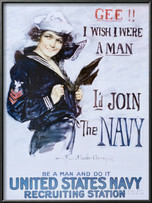 For more information, visit www.TheyShallNotBeForgotten.org or call the 937-332-8852. With her renderings of dark-humored, quirky figures she aims to generate collective memory and initiate narratives that are neither quite real nor entirely imagined. Please come enjoy the exhibit and discuss it using the biggest words you know. Audrey Zofchak lives in Ferndale, Michigan in an old bungalow with her beloved husband and an oversized house cat. She spends her time painting monsters and cats and is currently a graduate candidate studying Fine Art at Wayne State University in Detroit. And when she is not painting or studying, Audrey also teaches art, design, and new technologies to youth in the neighborhoods of Detroit through the College For Creative Studies Community Arts Partnership. Approximately one year ago, Troy High School graduate of the class of '67, Jane Thompson Webb, orchestrated a mini class reunion of some of the women in her class at K's diner in downtown Troy. Jane was a new quilter, but had a drive to do something to memorialize her brother who died as a result of chemical poisoning from the Vietnam War. The girls who gathered on August 5, 2015 had no idea that they were about to be drafted. Indeed they were and went willingly to serve. They started out in quilt boot camp learning the basics and progressed to more advanced techniques. To date the '67 Quilters group has increased to 35 members and has made 50 quilts for the families of the men and women who died as a result of Vietnam, as well as the vets who graduated from THS in 1967. They are now working to register their quilts with the Quilts of Valor organization which records the quilt maker and the recipient, thus creating a page in history stitched with the stories of love and compassion, celebrating the memories for all those involved. 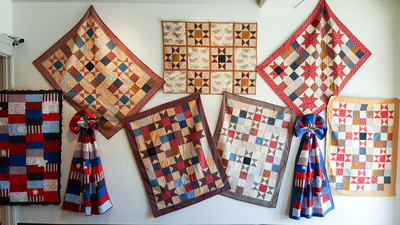 An exhibit of the quilts will be only display in the Mayflower Arts Center’s Lobby Gallery, August 31 – October 1, with an open reception on August 31 from 5-7pm. Admission to the exhibit is free and open to the public. Gallery hours are Wed-Thurs, 10am-2pm; Fri-Sat, 10am-6pm. The Mayflower Arts Center is closed Sunday through Tuesday. The exhibit is part of a month-long series of events in downtown Troy this September, sponsored by in the Patch designs, a local downtown merchant featuring hand, over-dyed wools including threads for your wool projects, plus locally hand crafted gifts. Events include a self-guided quilt walk as well as a free screening of the movie “How to Make an American Quilt” on September 17 at 8pm at the Mayflower Arts Center. Before the movie, Mayor Michael Beamish will recognize Phyllis Meiring, owner of in the Patch designs, for being awarded the 2016 Featured Shop by Better Homes & Gardens Quilt Sampler magazine. Phyllis will also have copies of the fall/winter edition of the magazine for sale and signing, which features her quilt design "Chillin' in the Woods" on the cover. Phyllis designed the quilt using batiks, quilting cottons, and homespuns with delicious wools as appliques. The exhibit features two local artists, Samantha Stone and Alicia Rubin--both of whom are graduates of Edison Community College. Sam Stone also received her BFA from Wright State and Alicia Rubin received hers from Antioch College. 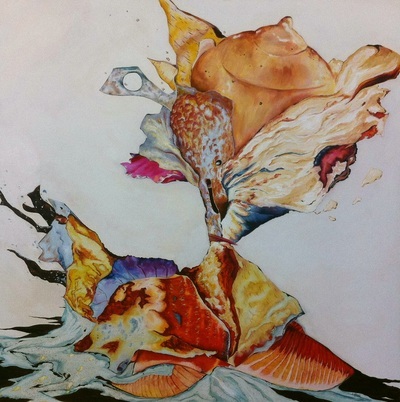 Alicia Rubin and Samantha Stone present 2D works devoted to alternative processes in painting and printmaking, including wood prints and intaglio. Their work varies in levels of non-objective abstraction with scales ranging from 16”x20” to 7’ in dimension. Each artist has used a variety of colors, techniques and applications to create their one of a kind works. Pulling inspirations from real life experiences and the fascinating study of psychology, you won't want to miss this colorful and intriguing odyssey into their collective world of art. You can call Alicia Rubin a dabbler. She has always been fascinated by art, even as a child. Growing up she entered all sorts of coloring contests and would win -- a very big deal to a 7 year old! Alicia always colored in the lines and found it hard to believe that it was somehow so difficult for the other kids to do the same. Everyone told her growing up that she needed to pursue her interest in art when she got older. Well she got older indeed and set her sites on attaining a college degree in art. She graduated from Edison State Community College with an A.A. in Fine Art, then transferred to Antioch and graduated with not only a B.A. in Visual Art, but a double major in Psychology as well. It was here that Alicia learned that these two areas of study were vastly similar. Both are fundamental expressions of our mind and soul. It is from the depths of our psyche that we create art. Art is how we express our sadness, our happiness and joy. It’s how we make social statements or bring to light some sort of deep internal strife. The psychology aspect of all of this then, is why? What drives us? Why do we feel the need to create and then express this emotional longing with the world, with the viewer? There is a duality that goes on between artist and audience. This is why non-objective abstraction appeals to Alicia and why she finally learned not to paint inside the lines. Trees are trees and birds are birds, but what lies in between such forms, in between the layers of our mind? She can apply her paint to canvas, slap a title on the work and tell you the viewer what it’s “suppose” to be, but she rather each viewer look at her work and make up their own mind. What internal thoughts of each person is being subconsciously reflected by simple strokes of paint? 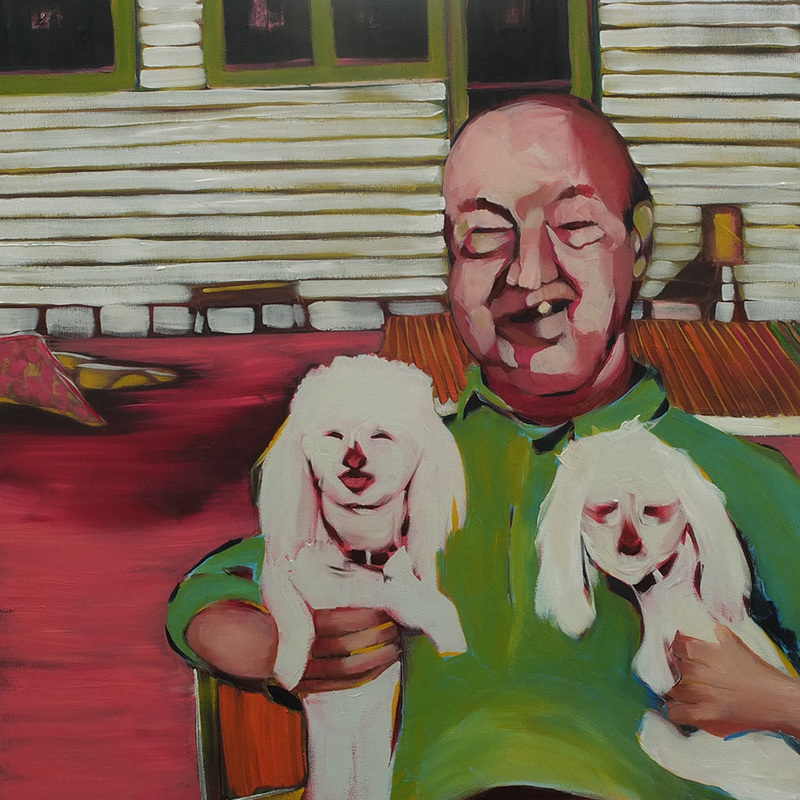 Each painting is merely an application of the human condition put down in color. One in which each person, should not be asking the question, “What was the artist thinking?”, but should be asking, “What am I thinking? ​In our world today we are bombarded with over a billion images everyday. From the moments, when we look out our bedroom window, to the seconds we switch on the television, we are being exposed to thousands of pictures. Most images will only be looked at for 15 seconds while other pictures will capture our undivided attention and force us to see these images a few seconds longer. All Samantha Stone's art pieces are about making a good lasting impression by drawing from her personal experiences, inspirations and then using artistic techniques to create these images in 2D plane. Samantha was born in Piqua, Ohio. She is a graduate of Wright State University with a B.F.A with a concentration in Photography. Samantha still lives in Piqua with her husband and her beautiful daughter. With Terry Glass’s interest in art, history, architecture and love of photography, this project was an ideal endeavor. He had photographed five of the missions previously and in October 2015 embarked on visiting all twenty-one missions. His 650-mile journey ranged from San Diego to Sonoma (north of San Francisco) along the El Camino Real (now Highway 101). The missions are about 30-40 miles apart, which was a days journey in the late eighteenth century, allowing him to visit two missions per day. 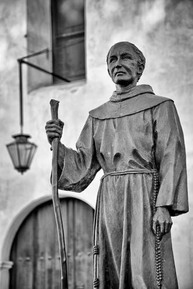 These religious outposts; established by Catholic priests of the Franciscan order between 1769 and 1823, to expand Christianity among the Native Americans northwards from Mexico into what is today the state of California. The missions were part of a major effort by the Spanish Empire to extend colonization into the most northern and western parts of Spain’s North American claims. The missionaries introduced European agriculture, ranching, and customs into the region. However, the missions also brought serious negative consequences to the Native American populations with whom the missionaries and other Spaniards came in contact. Terry Glass is a fine art photographer who works primarily in black and white and alternative processes. Many in his family were photographers. He has been photographing since his early teens, worked for a commercial photographer, and pursued photography as a life-long endeavor. Glass prefers quiet and solitude in many aspects of his life and his subject matter tends to reflect this by photographing landscapes, still life, old buildings, early Americana objects, and abstracts. A love of travel has led Glass to photograph in many different locations. He enjoys the challenge of slowing down, seeing what is beyond first glance, and having the patience to wait for the light or atmosphere to change. His desire is to communicate to the viewer some sense of what he saw or felt at the time of photographing. If the viewer catches a sense of organization or serenity, then Glass considers the image successful. career was spent in engineering, sales, and marketing communications in the electric motor industry. Glass and his wife, Jan reside in Tipp City, Ohio. They have two children and four grandchildren. It was back in December 1976 that the idea of having a community festival in Troy, Ohio was first conceived. The Troy Strawberry Festival started in 1977 with an initial purpose – “To have all the service clubs participate at one time and to combine their energy into one great project that will benefit both the City of Troy and the service clubs themselves.” This common effort will promote and strengthen the City of Troy and the Troy Chamber of Commerce and will help interclub relations. It would bring money into the City of Troy, bring publicity to the community and give the citizens of Troy, Ohio something to be proud of. The 40th Annual Troy Strawberry Celebration exhibit will be on display in the Mayflower Arts Center's Lobby Gallery through June 11. * For more information about how you can view a free screening of the documentary "The Troy Strawberry Festival: 40 Years in 40 Minutes," click here. The Mayflower Arts Center is proud to present Women's Untold Stories: The Exhibit featuring the artwork of Eolia, Kentucky Appalachian artist Barbara Church, Troy artist Nancy Shuler, and Piqua artist Linda Hamilton. The opening reception on April 1 from 5:00-7:00pm is held in conjunction with the performance Women's Untold Stories: An Evening of Art, Dance, Music, and Theatre presented by Edison State Community College. Survivor of domestic violence Appalachian artist, Barbara Church maintains that in earning her degree in art at the University of Virginia/Wise that she was “painting herself out of the situation she had painted herself into.” Church presents watercolors from a collection of 20 entitled “Black Slip.” The collection features women moving from the confinement and dangers of domestic violence to free themselves and reclaim their independence and self-esteem. The garments of the women featured go from very dark to lighter with the final portrait in the collection of a woman wearing a flowered dress as she walks away from the humiliation and defeat of domestic violence to not only survive but also survive with joy. African American artist, Linda Hamilton retired recently from Piqua City Schools after decades of teaching students to develop their skills in drawing and painting. Hamilton earned her B.S. from the University of Dayton and her M.A. from Wright State University. She is inspired by the works of Henry Tanner who “depicts humble subjects and makes statements about African pride and dignity.” Patient and introspective, Hamilton prefers “oils because, unlike other media, there is the opportunity for change, for pausing to reflect. Her featured work at the gallery is a painting of her daughter at age three and a recent oil of her mother-in-law, age 91. Troy artist, Nancy Shuler determined at age 57 that it was time to return to college to earn a degree in art at Wright State University. Shuler’s featured artwork includes a painting of a teen at the Troy levy, a self-portrait and an image of a woman walking on a tightrope. She expresses her passion for life in music and visual arts. The exhibit will be on display in the Mayflower Arts Center's Lobby Gallery through April 30. REM Opportunity Center— an Adult Day Services facility located at 721 Lincoln Avenue, Suite B, Troy, Ohio—offers a variety of recreational and vocational services for adults with developmental disabilities. REM Opportunity Center is committed to promoting independence, skill development, personal choice and growth through their service programs, including all aspects of art, providing the opportunity for individuals to express their talents, as well as create relationships with others within the community. The exhibit, Spring into Art, features 2D and 3D work designed an created by the artists of REM OC and will be on display at the Mayflower Arts Center Lobby Gallery, March 9-26. All artwork is available for purchase, with 70% of the artwork retail price being paid to the artist who created it. Art for Adoption began with a desire to do something to help the 153 million orphans worldwide. The Art for Adoption exhibit will feature a variety of mixed media artwork by local artist, Robyn Terry, including the featured painting titled Journey. 100% of the proceeds from this show will directly go to AFA's featured family this month, the Schaadt family, who is in the process of adopting Nyah, a two year old orphan in China. In addition, all purchases will be matched, dollar-for-dollar, up to $3,500! 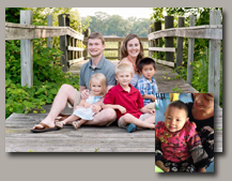 Thank you in advance for supporting our project and helping to bring Nyah home to her new family! Journey, 10 x 10 original, one-of-a-kind, mixed media painting of a young girl embarking on a spiritual journey. Her eyes are fixed on the horizon, her heart is steadfast within her. She is ready to grow, following God higher and deeper as He leads. A perfect image for the start of a new year, a heart set on pilgrimage to God. The painting is on a thick, gallery style canvas with painted sides. No frame needed, comes ready to hang. The composition features whimsical details, including a sweet bird travel companion, a few trees etched with musical notes to go with the words in the upper left "a musical journey". A tree made out of washi tape adds a fun pop of pattern, the girl's collar is inscribed with "dreaming by the river", and the roses have texture you can touch. A fun, playful piece with a significant message. Using the ability God has given him, Steve Wohler enjoys bringing to canvas the essence of what it means to drive a muscle car, wrench on a roadster or tinker with an old truck, expressing the nostalgia, beauty and adventure of the automotive lifestyle. Being from the Dayton, Ohio area, which has a long automotive history, Wohler has been fascinated by the area’s classic car and hot rod scenery since an early age. At five years old, he knew the make of almost every car on the road. As hot rodding and cruise-ins continue to thrive, it is a privilege to honor this rich tradition with accurate, yet artistic brushwork. Having owned a few classic vehicles himself, Wohler understands the thrill of taking them out on the road, participating in several car events a year. Wohler works in oil on canvas and has won numerous awards including “Best of Show” for his automotive and portrait work. His paintings have been on display at the Dayton Concours d’Elegance for the last seven years running. He has also exhibited at the Cincinnati Ault Park Concours d’Elegance and the Auburn, Indiana Automotive Auction. Steve Wohler's automotive paintings will be on display at the Mayflower Art Center's Lobby Gallery January 13 through February 13, 2016. His original paintings and prints will be available for purchase though the gallery. Steve Wohler is driven to portray a sense of automotive nostalgia, to recapture the feeling of a time past, drawing much of his inspiration attending car events, especially small town cruise-ins set among the historic buildings. He enjoys depicting the shiny finish of a muscle car as well as the rusted patina of an old farm truck. Each one has its own personality, character and story! As Steve's paintings are viewed, the places and the vehicles too may be recognized as they are indeed, locally driven. 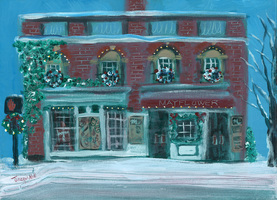 "A Troy Christmas, Series 2015"
Miami County artist Jacqui Lowther Noll introduces her 2015 Christmas Card, “Mayflower Arts Center” the nineteenth addition to her “A Troy Christmas” card series started in 2006. Jacqui’s concept was to combine her Christianity with her God-given artistic ability. “Since I am celebrating 10 years of creating the “A Troy Christmas” card series, I decided to paint the Mayflower Arts Center, Troy’s newest art center. visual and performance arts space now known as the Mayflower Arts Center. 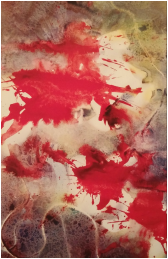 Jacqui will be selling her unique cards along with selected paintings at the Mayflower Art Center's Lobby Gallery November 14 through December 19, 2015. Jacqui Noll is a graduate of the Edison Community College Commercial Arts program and continues to work locally as a commercial artist. As part of the inaugural Tribute to the Troops Variety Show on Friday, November 6, 2015, the Miami Valley Veterans Museum has included many items of war memorabilia to be on display in the Mayflower Arts Center’s Lobby Gallery. The items span WWII through present day and represent our local and fallen heroes as well as events and promotions documented during the conflicts. The Tribute to the Troops Variety Show—held Friday, November 6 at 6pm and 8pm— is a collaboration between The Miami Valley Veterans Museum, Hospice of Miami Valley, and the Mayflower Arts Center, as an annual fundraiser for the Museum. The inaugural show features Dayton’s own Patriot Pin-Up Girls, country singer Rick Sylvester, The Avalons’ own Tom Caldwell, singers Pam Haislip and “Songbird” Betty Tasker, The Tapcats, and much more! Designed to bring to mind the entertainment presented by the USO to troops overseas since 1941, the evening promises to be filled with great memories, singing, and dancing, as a way to say thank you to our veterans, active military, their families, and our community. The public is invited to browse the exhibit November 4-13, during regular the Mayflower Arts Center’s normal gallery hours, Wednesday-Thursday, 10am-3pm and Friday, 10am-6pm. The memorabilia will then be returned to the Miami Valley Veterans Museum as part of their permanent display. "Captive Hearts, Be Set Free"
Once upon a time, there was a little girl who dreamed of mysterious lands and magical creatures. As time passed and the reality of this life invaded her dream world, this little girl lost her vision and the expectation of the magic that resided within her heart. "Captive Hearts, Be Set Free" is the progressive journey of this little girl and the path she has traveled to reconnect with her child-like spirit of long ago. Come along and take the journey with us as we reconnect with the fun and fanciful fantasy of a child's heart and the treasures it bestows. Interesting to Note: Each of Amy's paintings in this exhibit including her abstracts have hidden (and not so hidden) hearts. Come look for them! Amy Jacomet studied advertising and fashion design at Columbus College of Art & Design. She loves to draw and write and has a deep love for fashion illustration and abstract and whimsical paintings. Amy started her own painting business, Revelation Art by AJ in January 2014. She lives in Troy with her husband, Jason. For more information about Amy Jacomet, visit Revelation Art by AJ. David Kenworthy is a conceptual visual artist based in Dayton, OH. Kenworthy is both self taught and is also educated in Fine Arts at Wright State University. He makes conceptual artworks, paintings, sculptures and installations. Kenworthy presents everyday objects as well as references to painting and architecture. 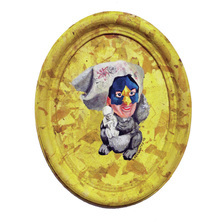 Pompous writings and Utopian constructivist designs are juxtaposed with trivial objects. Categories are subtly reversed. 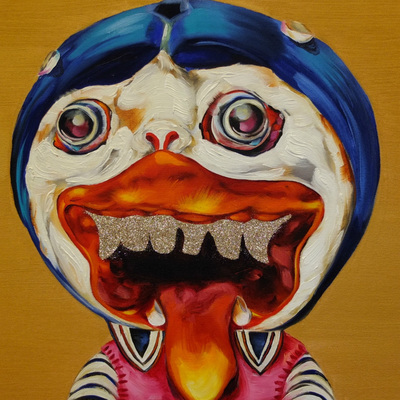 His conceptual artworks are saturated with obviousness, mental inertia, clichés and bad jokes. They question the cohesiveness that is derived from the more profound meaning and the superficial aesthetic appearance of an image. With the use of appropriated materials which are borrowed from a day-to-day context, he creates with daily, recognizable elements, an unprecedented situation in which the viewer is confronted with the conditioning of his own perception and has to reconsider his biased position. His work urge us to renegotiate conceptual art as being part of a reactive or – at times – autistic medium, commenting on oppressing themes in our contemporary society. 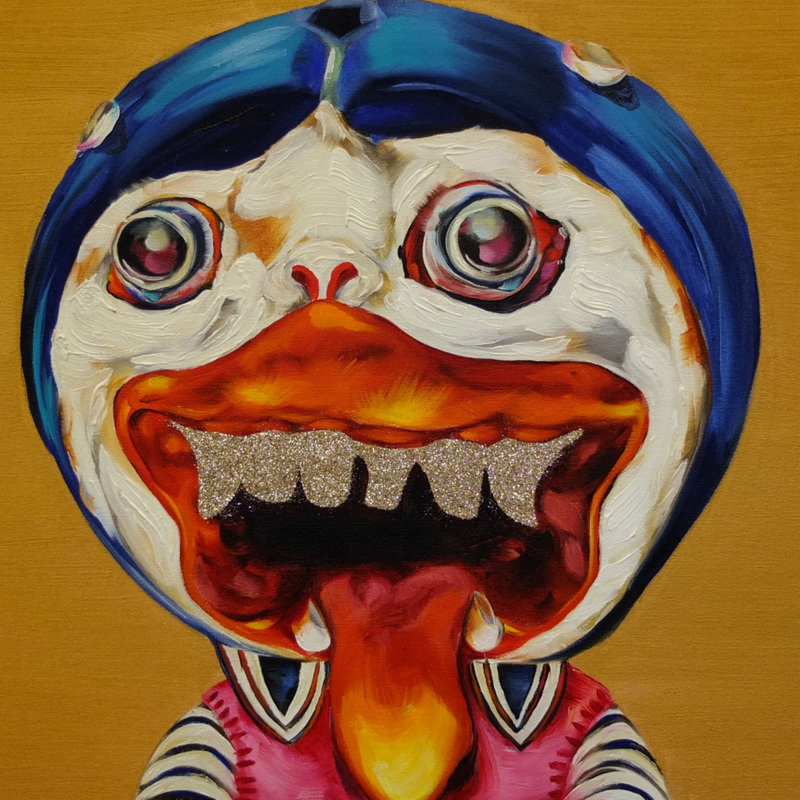 By focusing on techniques and materials, he makes works that can be seen as self-portraits. Sometimes they appear idiosyncratic and quirky, at other times, they seem typical by-products of American superabundance and marketing. He creates situations in which everyday objects are altered or detached from their natural function. By applying specific combinations and certain manipulations, different functions and/or contexts are created. By rejecting an objective truth and global cultural narratives, he formalizes the coincidental and emphasizes the conscious process of composition that is behind the seemingly random works. The thought processes, which are supposedly private, highly subjective and unfiltered in their references to dream worlds, are frequently revealed as assemblages. His works are notable for their perfect finish and tactile nature. This is of great importance and bears witness to great craftsmanship. By experimenting with aleatoric processes, he considers making art a craft which is executed using clear formal rules and which should always refer to social reality. For more information about David Kenworthy, visit www.davidkenworthy.com. The exhibit Organic Abstractions: Series 2 by artist Timothy Wells is a series of large photographic prints. Wells’ exhibit fills the Mayflower Arts Center’s Lobby Gallery with seven large abstract prints of photographs inviting the viewer to step in front of the images and create their own interpretation of what they see—worlds, places, people, or anything else their imagination sparks. Our featured artist for May 27-July 11 is Anicka Mabry. She and her fellow artists are members of Spire Arts, a Montgomery County Board of Developmental Disability Services organization whose purpose is to live, work, and serve in the community through art. Spire Arts supports artists with disabilities who want to take their passion for art to a professional level. The artists are encouraged to take their talents further by creating one of a kind pieces of art that express themselves. Spire Arts offers artists opportunities to show their work and assistance with selling the pieces. Spire Arts embraces relationships with other artists and the community. They hold events with artists who have disabilities and work with local artists to help Spire Artists grow and learn. Spire Arts has collaborated with the community on mural projects that allow the artists to showcase their talents while also serving the community. Anicka Mabry paints her world as she sees it, and her art is a gift she loves to share with others. The importance of family and community can be seen in every piece. 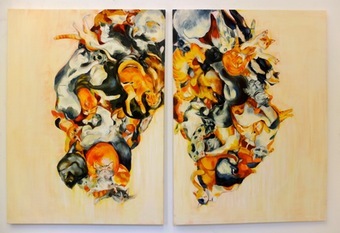 Socialization is a recurring and overriding theme in her work. Each character is carefully drawn and plays an important role in the story captured through the art process. Color, line, and shape all combined with emotion and paint result in truly one-of-a-kind works of art that are genuine expressions of self. Inspiration is often found in coloring books which Anicka loves to carry with her every day. Her smile is infectious and only gets brighter when she discusses her work. Each painting holds so many details that every time you look at her work you will see something new. Jeffrey is a dedicated and positive artist at Spire Arts. All of his artwork is based on the places he loves throughout the community. Jeffrey specifically loves trains and painting murals. Kevin loves to use colors and shapes in the pieces he creates at Spire Arts. He also likes to watch TV and is a Bengals fan. Like his artwork, Kevin has a colorful personality that makes it easy for him to make friends with everyone he meets. Nick is the creator of the Booger Boys which highlight his cheerful personality. He consistently adds them to every piece he creates at Spire Arts. Nick also likes to listen to his CD player and cheer for his favorite teams, the Cincinnati Bengals and the Reds. Anita loves drawing, painting, and using bright colors in everything she makes during her time at Spire Arts. She gets most of her inspiration from family and enjoys portraying them in her creations. Anita also likes walking, doing puzzles, and attending church. Cheryl is an extremely expressive, vibrant Spire Arts member. She loves adding various colors and textures into her paintings. In addition to doing art, Cheryl likes being involved with the community, with the community being the main inspiration for her artwork. Alicia is very good at using different art mediums while in the Spire Arts studio. Bold, bright colors that really attract the eye are often seen throughout her creations. Alicia also likes sewing gothic dolls and making monsters out of clay. Margaret loves painting and drawing in the Spire Arts studio. She is known for her signature dots within her designs. Margaret is also skilled at crocheting and makes blankets and cup cozies which are sold at the Second Street Market. Carol participates in Spire Arts once a week and loves her time in the studio. Outside of the studio, she likes working in the café at the Liberty Center and is an admirable worker. Carol also enjoys volunteering at SISCA. Angelo is a friendly, social Butterfly. He devotes a lot of time and energy to volunteering within his community at Possum Creek Farm. In his spare time he enjoys dancing to all types of music. Marshay is a bubbly young woman. She enjoys expressing her personality through her art at Calumet Center. Marshay loves dancing and spending quality time with her friends and family. Tim enjoys painting and drawing while he is at Spire Arts. He often incorporates words and numbers in his artwork. Portraits of family members are throughout his creations, too. Tim also likes participating in computer class, dancing, and bowling. Donald is a Spire Arts member who enjoys painting with acrylics and watercolors. He especially likes painting cityscapes and is a fan of Disney and Pixar. Donald also loves playing basketball and being out in the community. Joe is an extremely interactive person and Spire Arts artist. He loves painting fish and dancing. Joe is also an enthusiastic Cincinnati Bengals and Reds fan. Carole greatly enjoys her time in the Spire Arts studio, especially when painting and drawing. She is an avid Johnny Depp fan and loves incorporating her original drawings of him into her creations. Carole also likes watching TV and eating. The Mayflower Arts Center is pleased to host Cincinnati-based fine art sports painter Chris Felix's exhibit "Cincinnati Reds Legends" featuring paintings in the new book by the same name. The exhibit premieres at The Mayflower Arts Center's Lobby Gallery before moving on to the Reds Hall of Fame & Museum and then The Louisville Slugger Museum later this summer. "My style of painting resonates from a comprehension of human and natural motion. Beauty is found in the quality of specific motion or lack of motion. The distinction of every person as an individual is important to me and I believe intricate details tell stories of their own.Making a painting encapsulates a collection of thoughts for me. These thoughts become one using layers of liquid color, brush stroke after brush stroke. Joyfully, painfully, patiently and passionately, each stroke becomes a brick in a strong finished structure. Chris Felix is a native of Cincinnati, Ohio and is an artist who specializes in fine art acrylic sports paintings. 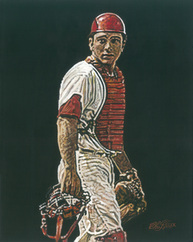 A graduate of Elder High School and the College of Art Advertising in Cincinnati, Chris first received recognition for his art as a sixth grader at St. William School when his pencil sketch of Johnny Bench won him a Cincinnati Reds autographed baseball in a local department store's "Draw Your Favorite Reds Player" contest. Highlights of Chris's art career include being a graphic designer, a scenery painter for major amusement parks, and a toy prototype painter for Kenner/Hasbro and Warner Brothers. He has been a freelance fine artist since 1997. 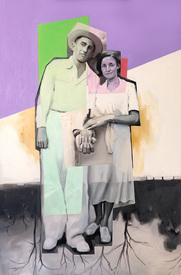 Felix's style of painting resonates from a comprehension of human and natural motion. Chris has been a competitive baseball player for over 40 years. He draws inspiration from a time when listening to the Big Red Machine with Mom, Dad and Grandma on the front porch and playing stick-ball in the street were common events. His work has been exhibited throughout the United States. A book about the Reds most incredible players since the first professional baseball team started in Cincinnati in 1869. Written by Cincinnati author, Mike Shannon with paintings by Chris Felix, Donnie Pollard, and Scott Hannig. Artist Reception: Saturday, March 14 @ 7:00-8:30pm. Local fine art painter and muralist, Mila Hamilton, is the featured artist at the Mayflower Arts Center, downtown Troy. 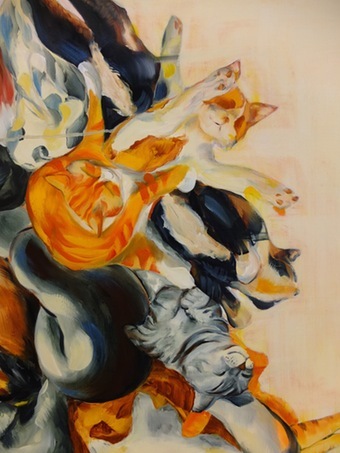 Her exhibit, Animals of the Ark is currently on display through April 11 in the Mayflower Arts Center’s Lobby Gallery. The Mayflower will host Hamilton’s artist reception on Saturday, March 14 from 7:00-8:30pm. Please join us for a delightful evening as we meet Mila and hear about the inspiration behind her enchanting body of work. Imagine stepping back in history to when Noah was commanded to preserve two of every living creature and board them on the Ark while God destroyed the world around them. Imagine a vessel—filled to the brim—with one male and one female of every species—from elephants to mosquitos, lions to mice, and everything beyond and in-between. Imagine them in each other’s company, patiently waiting to be released once the storm subsided. Were they patient? Did they really tolerate each other? Will they return home? The story of Noah and the Ark is one of faith and obedience, as well as marvel and mystery. Inspired by her father’s love of the story, Mila Hamilton began her collection by studying each animal she painted, down to the smallest detail. She invites the viewer to gaze upon her work and marvel at not only the beauty and design of God’s creatures, but also understand how each is made uniquely with a purpose. Stare into their eyes. Trace the form of their nostrils. Fathom the wonder of God and the intricacy of his creations. While you tour the exhibit, consider for a moment that you are part of the action as you walk into the presence of the animals. Notice how they stop what they are doing and look out of the canvas back at you! Empty walls and empty canvases are Mila Hamilton's opportunity to have free reign to exercise a whim well beyond the ordinary. Hamilton studied art and business management and administration at Concordia College and Indiana University East in Richmond, Indiana. Since 1987, she has operated “Expressions by Mila,” a decorative painting business, painting murals and faux finishes in homes, businesses, and churches. She is the owner of Gallery 2:TEN in Sidney, Ohio, where she lives with her husband and dog, Pinot. Artist Reception: Saturday, January 31 @ 6:30-8:30pm; Artist Talk begins at 8:00pm. Michael L. Kimble has been taking photographs since 1979 shooting 35mm, medium format, and 4x5, specializing in black and white landscapes. He spent 20 years free-lancing in Naples, Florida and spent 7 years documenting migrant farm workers, drugs, prostitution, aids and other social ills in Immokalee Florida. His photographs have been in numerous publications and shows, have won many awards, and are in corporate, gallery and personal collections across the country. He is now living in his home states of Indiana and Ohio, photographing landscapes and lake areas. 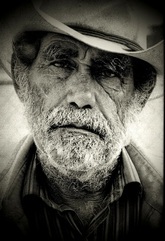 For more information about Michael Kimble, visit www.http://michael-kimble.artistwebsites.com.